"My favorite director still making movies just might be Anderson. I don't think I've seen a movie of his yet that I haven't liked. My particular favorite of his has always been Magnolia. For me, it's an aesthetic about it. I prefer highly detailed movies that have definitive time frames. I enjoy movies that take place in short periods of time, because I see the detail put into the stories. That alone, though, couldn't put Magnolia over There Will Be Blood. I had only two, maybe three characters I genuinely cared about or connected with. Though the narrative is a masterpiece, the number of I retesting characters are limited. In Magnolia, I stay intrigued with some of the minor characters even. It feels real because the people feel real. Not to mention the diversity in the characters. Anyone who watches this can relate with at least one character. And all the little hints that intertwine the stories or the Genesis 8:2 references laced in Thomas hard to see spots call for multiple watchings. 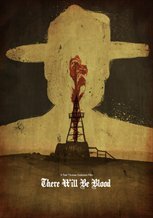 Not to say that There Will Be Blood doesn't. In fact, TWBB may even be better the second time through when you have the full knowledge of Plainview's state of mind. Both films are amazing, camera work and narrative. But Magnolia inched its way farther up on my list. "